Under Pressure… In centuries past a thatcher was often jokingly called a ‘Hangstraw’; but to any, using the standard method of thatching, this was and is an insult. 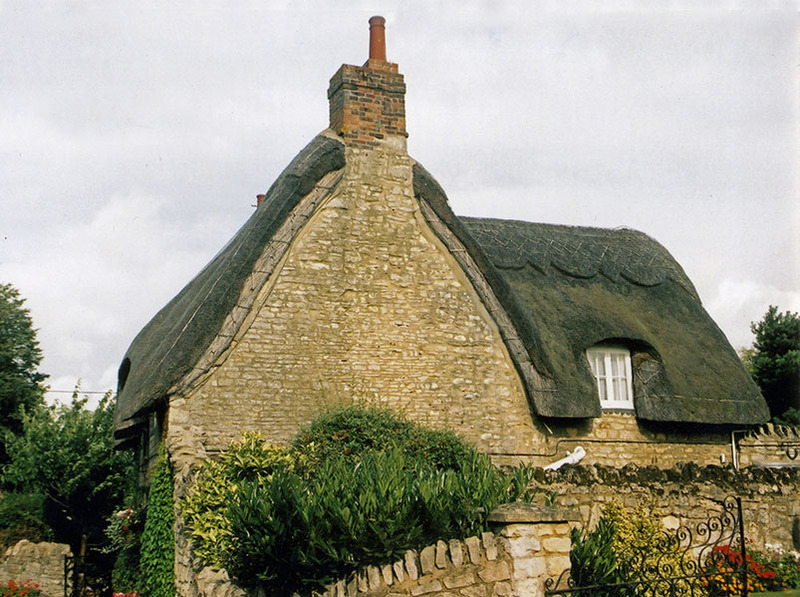 As standard thatching most certainly does not simply ‘hang’ from a roof, held on by its fixings. 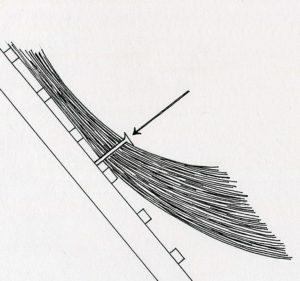 Springing, whilst coating a roof, is obtained, by the thatcher constantly creating a dished surface; to which a fairly straight thatching material is fixed down on. This downwards compression is where the material is held in place by what is often called the line of fixings, holding it tightly on the roof. As shown opposite. An easy method is to fix a wide Fascia Board, to the wall plates, all round the edges of the roof. On the eaves, a fascia board of between 6 to 9 inches (150/225mm) wide will create enough tension for most roofs. As shown opposite, this creates an upward pressure on the first layers of thatch. On any gable ends, a board standing proud of the wallplate by around 1 to 2 inches (25/50mm), is normally adequate. Instead of a fascia board, a little less tension can be obtained, by using a Tilting Fillet or Arris Rail. This is a triangular shaped length of wood that can be used like a fascia, on the gable ends and be fixed to extend the wallplate outwards. A 3×3 inch (75x75mm) or 4×4 inch (100x100mm) timber, cut diagonally, will normally suffice. If a new roof is being created, these timber details are normally carried out by the roofing carpenter. It is good working practice for the thatcher, to meet up and finalise what timbering they require with the carpenter; early on in the roof’s construction. As most carpenters have little experience of creating roofs for thatching. 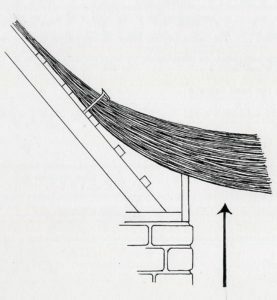 As shown in the Thatch Timbers & Features page, the rafters and other main timbers, on a thatch roof, are similar to a roof destined for tiles or slates. A difference being the distance between the roof battens; these are generally wider apart, than for other roofing materials. For the wheat thatches, 9 inches (225mm) between the centres of the battens is normal. 12 inches (300mm) is usual for water reed. Any wider and the material may slip into the roof space. As a single layered thatch is completed, it is good working practice to cover the battens with a thin Liner of thatch. This is placed behind the coatwork and stops any thatch from sliding under the roof battens. It also presents a tidy surface to any work, from inside the roof. Laying the dolly… A steep ridge is created, by the springing at the top of the roof. This is created by fixing Ridge Rolls or Dollys. These are made in various diameters, by laying thatch out in a line and tying it every 12 inches (300mm) or so, into a long firm bundle. The first one used, is around the size of a water reed bundle. Often these are used as they are, tied head to toe and fixed securely, along the ridge timber. The coatwork; except for the final top course, covers this first roll. A second roll, about half the size of the first, is then fixed. This is covered by the final course of coating. Finally, a third, even smaller roll, is fixed before the ridging is commenced. (On a multilayered roof, the first roll is not normally needed; unless the top of the roof has been allowed to decay badly.) 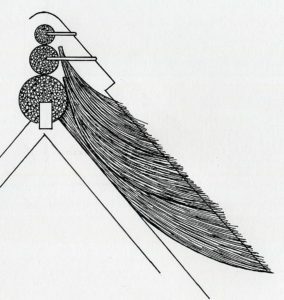 Apart for increasing the pitch, of the final courses of coatwork; these rolls act as a firm base for any ridge thatching spars to be driven into. Stripping down… With a multilayered roof, the thatcher often needs to remove some old material, before recoating. 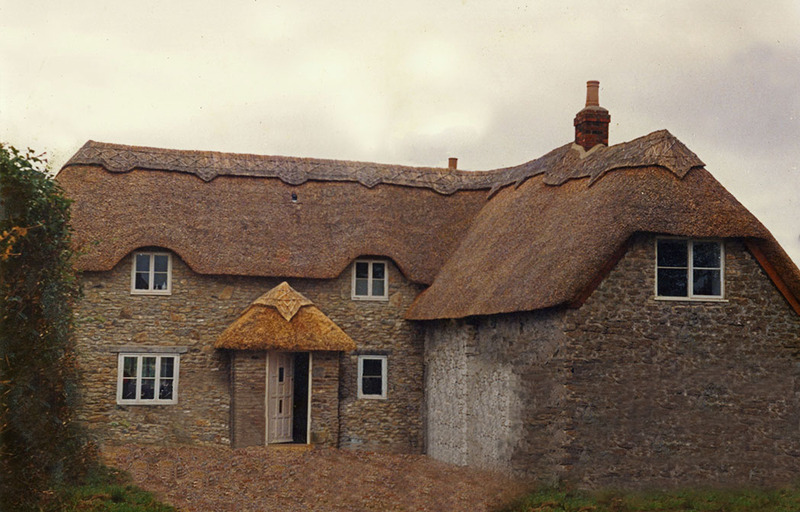 If the previous thatching was done well, then all that should be required is to strip off the remains of the previous thatch and start again… If only life were that simple. In practice, the job could entail stripping off several layers of old coating and also doing some timberwork repairs. If like is being replaced by like, then the springing around the edges of the roof, should already be correct. But if water reed is being used, for the first time, extra fascia may be required, to accommodate a longer material. The art of stripping a roof is a fine one. The object is to leave a firm base; to spar the courses of coatwork into. And also to create as steep a roof as is practicable. By removing the eaves and leaving as much old material as is possible on the ridge, the pitch can be increased. This is all well and good, as long as any chimneys in the ridge don’t start disappearing, in the thickening roof… Over the years this method has created some quite deep roofs, giving good insulation and preserving a wealth of historic information. A little more is removed for water reed than for the wheat based materials. Usually enough to allow the first couple of courses, to be fixed directly to the rafters; as a single layered thatch. Obviously thatchers should not strip more roof than their sheets can cover. 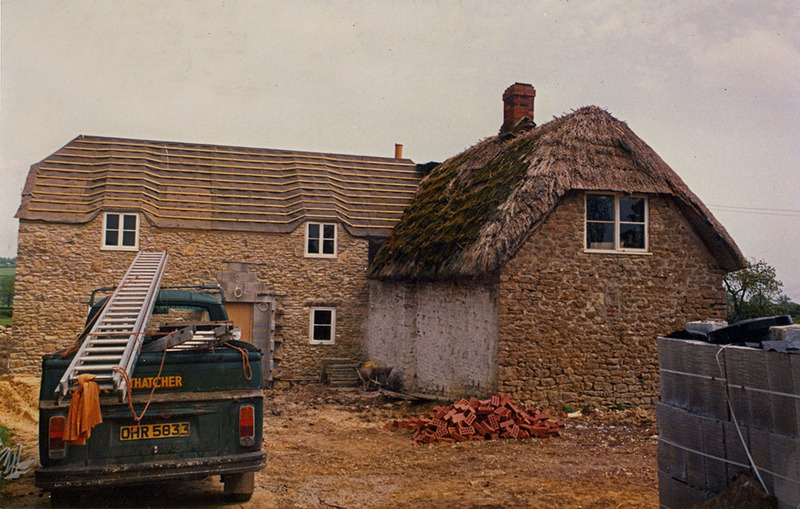 Some thatchers only remove enough for each day; or even strip the roof as they go. Whatever the method, the result is an awful lot of old thatch; which should always be disposed of immediately. Piles of dry old thatch are a fire hazard; after any rain it becomes a soggy mess. There is only one thing worse than moving old thatch; and that is moving wet old thatch! As ever with the craft, there are always some exceptions, to this method of roof preparation. In some areas it is normal practice not to strip out the old eaves and gables. This has the great advantage of not having to interfere, with often weak wall plates and rafter bottoms. Thus a lot of expensive timbering can be avoided. The first is to simply start laying the courses of thatch. The correct springing being achieved, after two or three courses have been fixed. These bottom courses are eventually fixed again from the outside, in a long straw fashion, with spars and liggers. (As shown opposite.) This method can create some very attractive thatched roofs. No springing, at St Mary Bourne, in Hampshire… Not for the first few courses at least. The tops of the windows, mark the point where some springing is created. Beneath this, some decorative spar work keeps things in place. 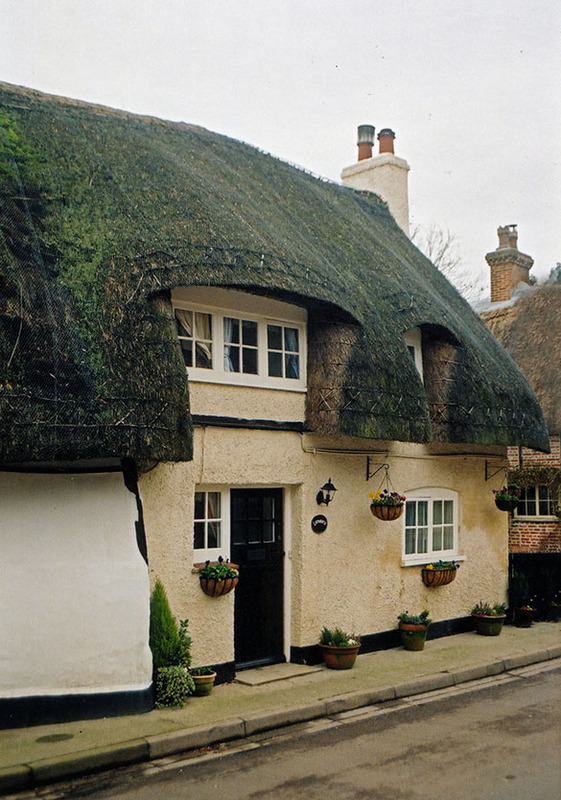 This a commonly found technique, in this and other counties, with a tradition of thick long straw thatching. The top image shows some neatly sparred springing rolls, at Castlethorpe in Buckinghamshire. 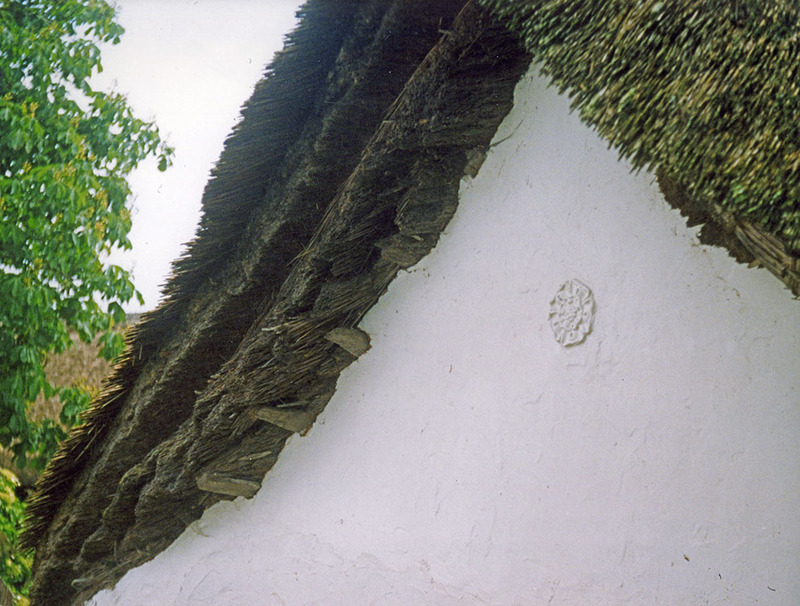 The lower photo is a close up of a gable end at Winkleigh, in Devon; that has seen no carpentry for perhaps two centuries or more… Careful examination shows at least five layers of thatch, with a springing roll added between the final two layers.